I can’t believe I’ve completed 10 weeks of training in preparation for the Moon Walk in May. The weeks are flying by and I’m learning new hints and tips each week. It’s become necessary now to take snacks and water with me when walking, and I’m starting to think about what I will need to take on the day to hopefully make the walk as smooth as possible. 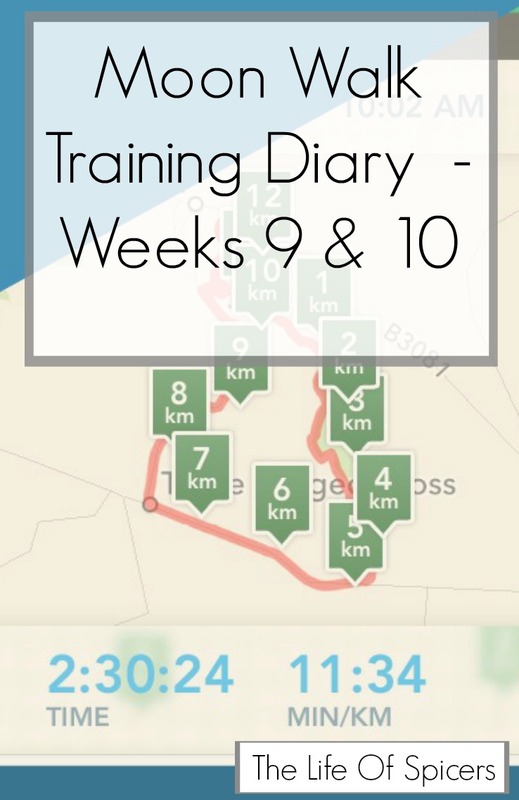 Week 9 was a big learning curve in what needs to be done through the week to make the longer weekend walk easier. Week 9 saw no midweek shorter walk and when it came to 14 miles at the weekend, it was a struggle to complete the last couple of miles. I think this was a lot to do with the fact that not a lot had been done in the week and also the end of the walk was done near my house and I didn’t like having to walk past it to carry on for another mile to get the distance in. Week 10 was easier because I made sure that there were additional walks in the week. I have learned that I can’t wear my wedding ring when walking as I get sausage fingers. I know how to avoid this by using my arms to propel me more when walking but my rings have started to feel uncomfortable so it’s easier to walk without them. I have also learned that I can walk and walk and walk, but the minute I stop my feet REALLY hurt, so I am starting to worry a little about the end of the walk on the night. I won’t have a bowl of hot water waiting for my feet or a bath I can jump into. I will have a change of footwear and clean socks to hopefully help slightly. I have one last week of distance to achieve 16 miles before a break whilst on holiday. I will still be walking a lot each day which will be good but the distance won’t be there, although I am taking my Fitbit so I can see how many steps you rack up walking around Disney World. Wow, you are brave doing the moon walk, I know a couple of people who did it last year and they say its amazing but tough. I wouldn’t have thought about training for it, and I’m sure you will be well prepared for those long Disney days!